Have you ever heard of a dewberry? If you aren’t from Texas, Mississippi or some other super Southern state, you probably haven’t. Until a couple months ago, I hadn’t either. One day, while out on a run, Nick spotted a thorny plant reminiscent of a blackberry bush, with tiny red berries on it. How he spotted this plant in a jungle of weeds, I have no idea (pilot eyes). But after he saw the first one, he saw another. And another. And another. They were growing wild all over base. We monitored these bushes for a few weeks and soon the tiny red berries grew and began to turn black. We assumed they were miniature wild blackberries, or maybe the elusive black raspberry. Then one day, I was sitting at work and grubby old bum came through the door, “Wanna buy some doooooobrys?” Bums wandering through the door selling things such as filthy looking boiled peanuts is not an uncommon occurrence, so I politely told him no and he was on his way. Then something clicked in my mind and I immediately Googled “dooberry.” Thanks to the mind reading powers of Google, a Wikipedia listing for “dewberry” came up. Lo and behold, I had, with the help of a homeless entrepreneur, solved our berry mystery! In a nutshell, dewberries grow like weeds all over the South. Especially here on base and in Meridian in general. They are everywhere. They are super delicate (aka hard to transport) and hard to harvest (super thorny bushes), which is why you’ve never seen them in a grocery store. 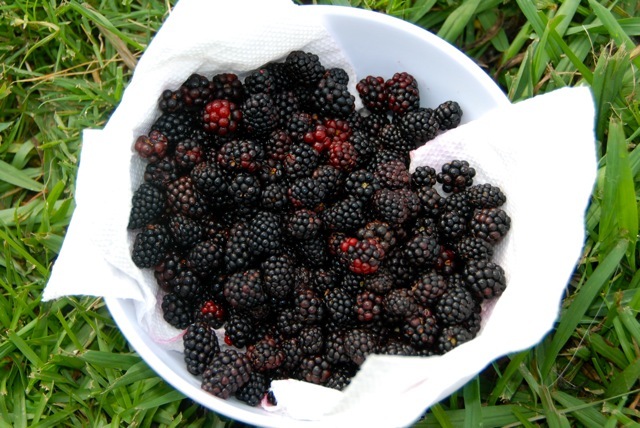 They’re the size of a raspberry or smaller and taste somewhat like blackberries, but less juicy and more seedy. We’ve been checking on the dewbs weekly, and this weekend it was finally time for our first harvest. This is only about 1/10 of what we collected. We spent nearly 2 and a half hours picking and returned home slightly sunburnt, bug bitten and scratched up like crazy (these plants have some serious thorns). But considering our bounty, I’d say it was worth it! 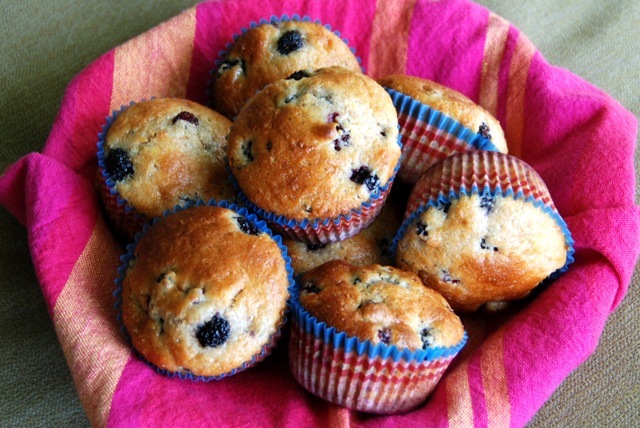 Some berries went into my belly, some went into the freezer, and some went into these muffins! 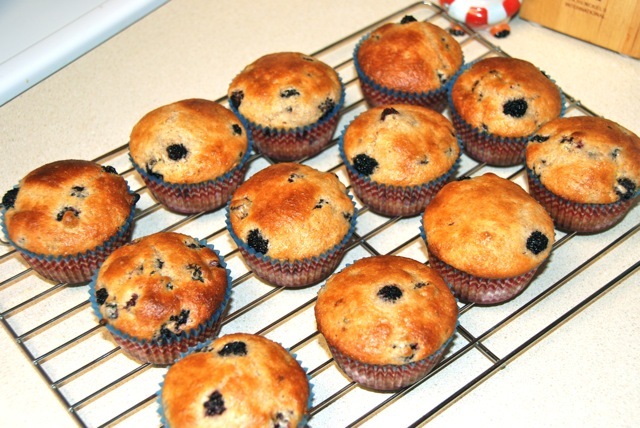 The muffins could easily be adapted to Lemon Blackberry Muffins, Lemon Raspberry Muffins, or Lemon Blueberry Muffins. Preheat oven to 400 degrees. In a bowl, combine flours, baking powder, soda, sugar, salt and lemon zest. In another bowl, whisk together butter, yogurt, lemon juice, extract, milk and egg. Pour the wet ingredients into the dry and mix until just combined. Stir in the berries. 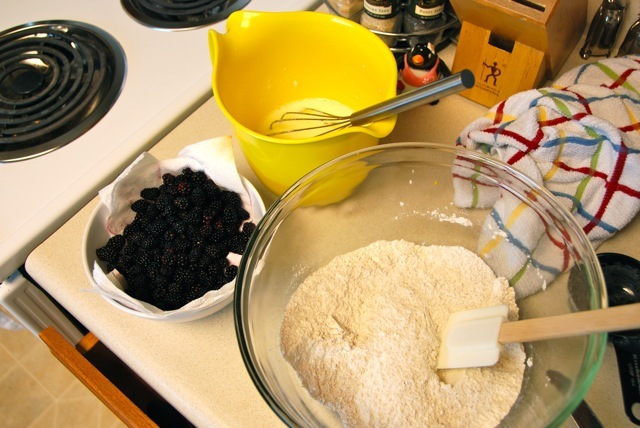 Tip: to prevent the berries from all sinking to the bottom of the muffins, toss them in a little bit of flour before adding them to the batter. 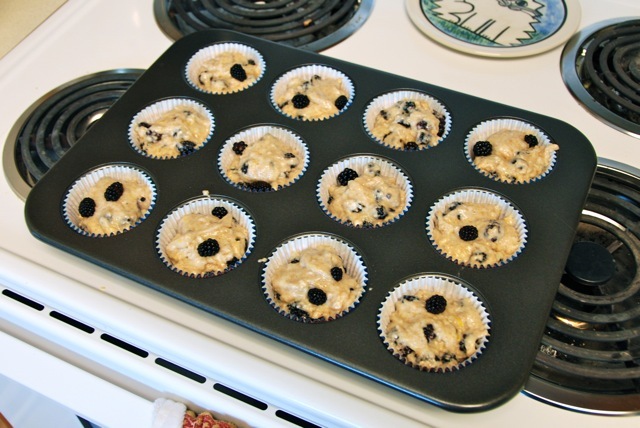 Fill 12 lined or greased muffin cups evenly with batter. Bake 20-25 minutes until the tops are golden and a toothpick inserted into a muffin comes out clean. 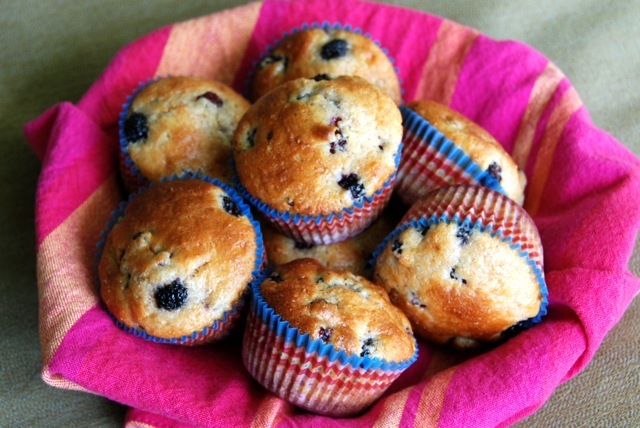 The muffins were perfectly sweet and I loved the lemon flavor with the berries. Dewberry recipe #1 was a success! Now… anyone have any suggestions for the rest of the berries? Make ice cream or sorbet! I have a suggestion…. put them in my belly! 🙂 I think those might grow in MA too, I always assumed they were wild blackberries, but the berries I used to eat all the time as a kid looked just like that and grew on really thorny bushes and were delicious!